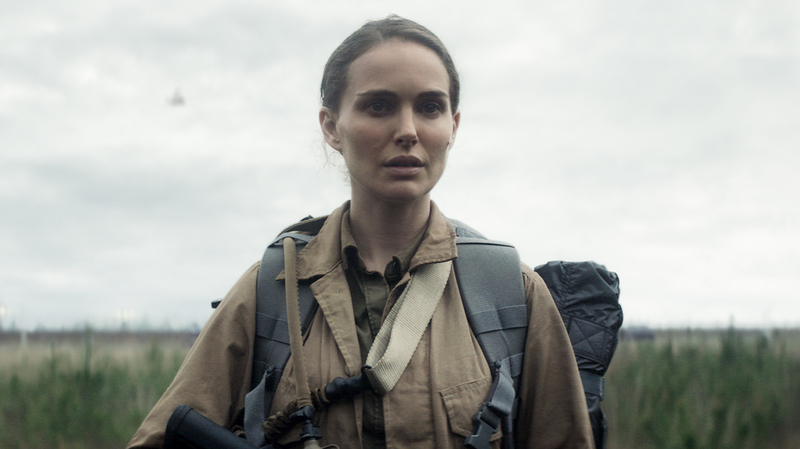 Pop Culture Happy Hour: The Mind-Bending Pleasures Of 'Annihilation' The latest film from Alex Garland, who made Ex Machina, lines up an impressive cast of women to go exploring in a bizarre and dangerous place none of them can fully understand. Natalie Portman plays Lena in Alex Garland's new film Annihilation. Annihilation -- the movie, not the experience — is creepy. Very creepy. There are elements of traditional horror in the latest film from Alex Garland (Ex Machina), which is based not very closely on the Jeff VanderMeer novel of the same name. But more than that, it's a film that capitalizes on its ability to create creeping, visceral dread. Natalie Portman, Jennifer Jason Leigh, Gina Rodriguez, Tessa Thompson and Tuva Novotny play women on an expedition into a mysterious and dangerous place known as "the shimmer." In places, it's a traditional intrepid-team-fights-beasties movie with echoes of films like Alien. But it doesn't stay in that mode. To talk about this really unusual film, Stephen Thompson and I were joined by noted Alien enthusiast Chris Klimek, as well as member station WAMU's Daisy Rosario. We talk — with as few spoilers as possible, though feel free to go in cold the way some of us did — about the film, the score, the visuals, the pacing, and why it's so much fun to watch some of these actresses extend their reach. We also talk about what's making us happy. Stephen is happy about an unusual Olympic story. Chris is happy about a new book about 2001: A Space Odyssey, as well as about his own piece revisiting a couple of key elements. Daisy is happy about beautiful bald brown women, as she puts it, including one she spotted at the NBA All-Star Game. And I am happy about a piece of absolute trash that's less guilt-inducing for me than other pieces of trash I have enjoyed. Find us on Facebook or follow us on Twitter: me, Stephen, Chris, Daisy, the show, producer Jessica, and producer emeritus Mike.